If you like a spot of shopping or just window wishing at a high end retailer, this one’s for you. Saks Fifth Avenue is home to some of the most luxury items available in Indiana’s capital city today. You just have to schlep from wherever you are to the concrete jungle up at Keystone at the Crossing to enjoy such luxuries. 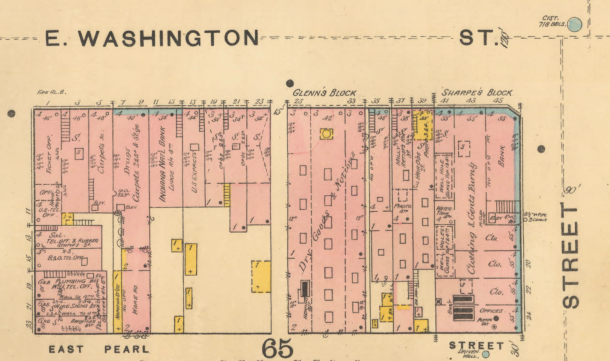 When the city was more concentrated–in the late 19th and early 20th century–much of the best shopping available to Indianapolitans lined Washington Street, in the heart of the city. That was when the closest thing to shopping mall was an arcade. (We had one: the Pembroke Arcade, also on Washington Street, but it was a far cry from the giant shopping malls we use today.) You may be surprised to learn that when Saks came to Indianapolis in the fall of 2003, it wasn’t the first time the namesake headlined a store in Indianapolis. “Four doors above old stand” intimates another shop preceded it, so clearly, Andrew Saks started his firm by 1867. Not too shabby, considering he was only 20 years old. It appears Mr. Saks went through a number of partnerships with other individuals to operate A. Saks & Co. 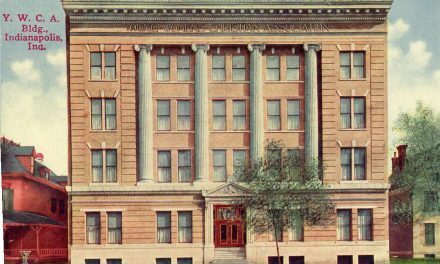 He dissolved a partnership with B. Katzenstein in July 1878; joined forces with his brother, Isadore Saks and William Gans for stores in D. C. and Richmond, Virginia; in 1885, Andrew and Isadore partnered with George C. Henning. It’s a maze of partnerings and dissolutions through a number of years, as Saks became more experienced and expanded his empire. 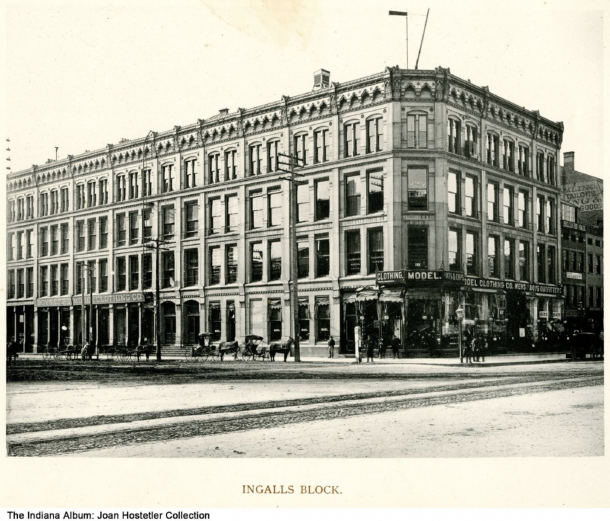 Ingall’s Block was Fletcher & Sharpe’s building and became the Saks Building, designed by William LeBaron Jenney in 1875. Image courtesy: The Indiana Album, Joan Hostetler Collection. 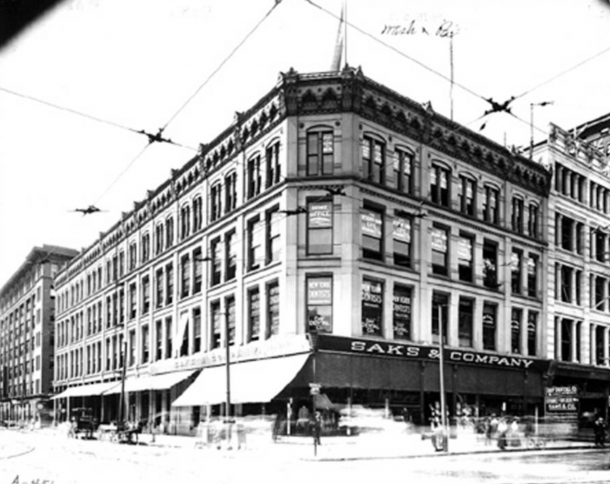 Andrew Saks first came to Indianapolis in the fall of 1896 when “Saks & Co.,” the business partnership with his brother Isador, purchased the Model Clothing Company. By that time, Saks & Co had stores in Norfolk, Virginia and New York in addition to the first ones in Washington D. C. and Richmond, Virginia. The Model Clothing Company had been operating through a trustee for a few months when Saks & Co added an Indianapolis store to their portfolio. 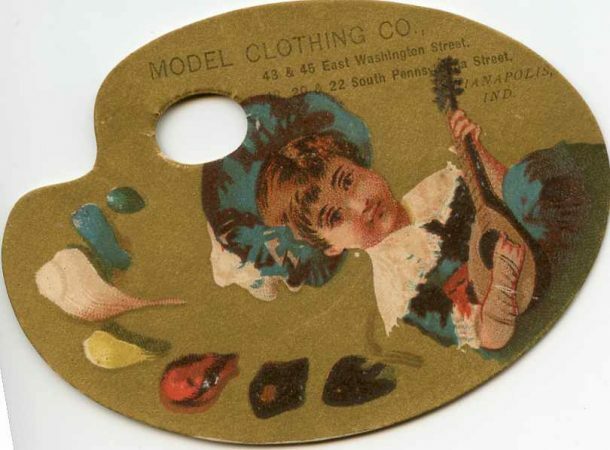 The Model Clothing Company first opened in September 1883, taking over the retail space in Fletcher and Sharpe’s block that was occupied by the New York One Price Clothing House. It gets confusing, because some ads of the era say “L. I. Mossler and Brother,” others say “N. Y. O. P. C.” or some combination thereof. Whatever the case, Lieberman I. and Solomon Mossler went bankrupt in 1883 and the Model Clothing Company took over their space in Fletcher and Sharpe’s Block. 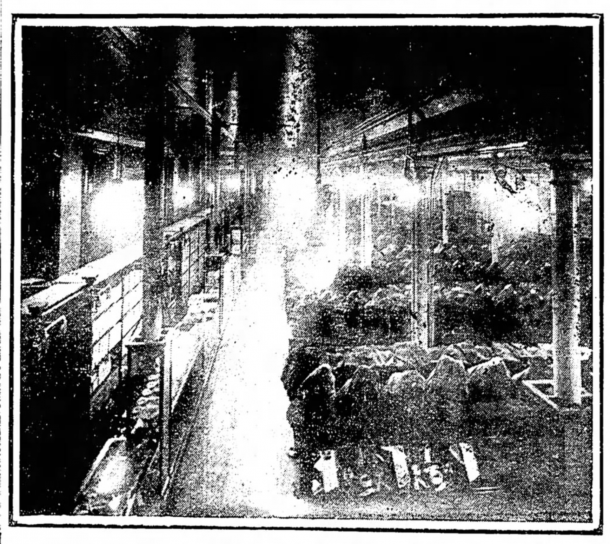 The Model Clothing Company brought in stock from their factory in Rochester, New York. In 1887, Model Clothing Company newspaper ads began listing the proprietors names: “Rothschild, Hays and Co,” though it is not clear if they had always been the owners. Between 1883 and 1896, one thing is certain: Model Clothing Co. advertised heavily. 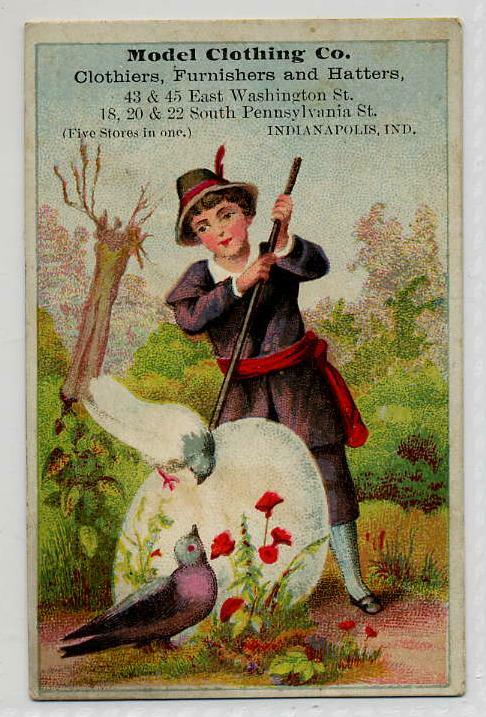 A wide variety of their trade cards can be found fairly easily amongst early trade cards and ephemera from online auction sites. A few months after Saks & Co took over the Model Clothing Store, the new owners remodeled their retail space and made some modifications to the entrance of the four-story building, designed by William LeBaron Jenney, of Chicago in 1875. Jenney also designed a couple of notable homes in Indianapolis, for Hervey Bates and James Woodruff. Inspired by the “Manufacturers Building at the World’s Fair” (which year or location is not clear), Saks brought to life an electrified front entrance with a “double archway of copper with four rows of arc lights.” Seven large windows, six chandeliers and more lights–the total estimated between 700-800 made the southwest corner of Pennsylvania and Washington streets one of the brightest, easiest to find retail establishments in the city. “On the left as one enters the store is the men’s furnishing department extending back to the Pennsylvania street entrance. This department must be seen to get an idea of its extent and beauty. From the entrance to the rear of the store is the children’s or ‘boys’ furnishing department, and the hat and cap department for the little fellows. On the right as one enters the store is the men’s hat department with its splendid mahogany fixtures. Adjoining that is the men’s and boys’ shoe department and that is followed up by the sporting goods and automobile apparel department. 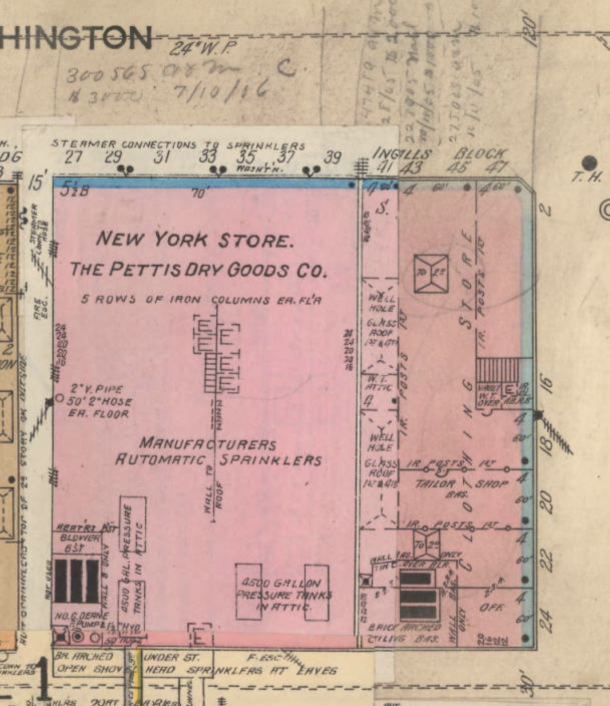 The entire center of the store to the Pennsylvania street door is occupied by the men’s department, fitted up in the most elaborate and tasty manner. At the end of this department begins they ladys’ and children’s department. A veritable panorama of the choicest goods are displayed and the boys can be fitted here in an overcoat whether the mother has $2 to $20 to spend. Every facility for the comfort of the customer has been taken care of. In the basement not ready for public inspection is the leather goods department and the receiving and shipping departments.” The bank vault, the last vestige of the former occupant of the corner business, was also removed and the elevator was moved to the front of the building. No expense was spared. And yet. Two and a half years later, in March 1908, Andrew Saks dissolved the company as it was; it was re-formed under his brothers, Isadore and Joseph Saks. Though Andrew did still own the building. Not two full years later, in January 1910, the remaining Saks brothers sold their store, stock and barrel to W. J. Fischel. The lock continued to belong to Andrew Saks. The name changed, but it looked much the same after Fischel acquired Saks. 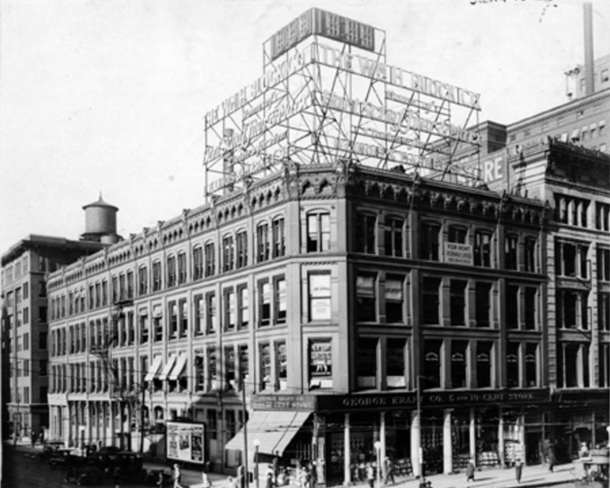 On April 9, 1912, Andrew Saks died and his three children, as heirs, were to inherit the Saks building in Indianapolis. His daughter, Mrs. Edgar J. Meyer was in Europe when her father died. She booked immediate passage back to New York, as it happened, aboard the ill-fated RMS Titanic. Lucky for her, she survived the horror; unlucky for her, her husband did not. 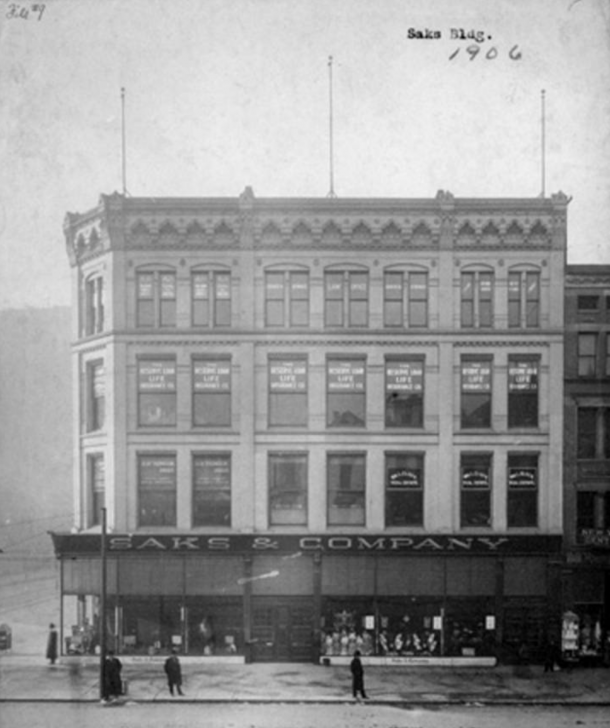 In the days following the tragic sinking, Indianapolis papers reported that heirs who owned the local Saks building were on the disastrous voyage. At first it was thought Mrs. Meyer had perished in the accident, but that turned out not to be true. 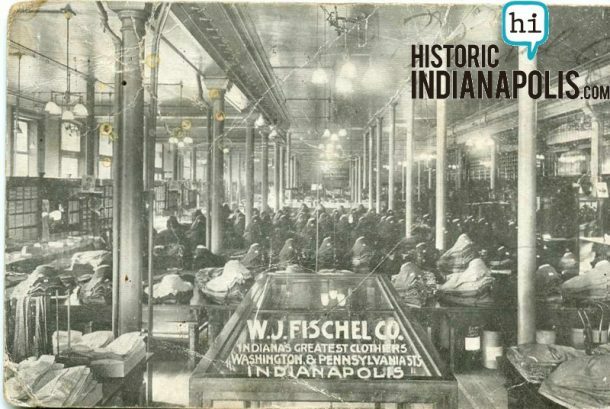 In the fall of 1912, Fischel announced he was retiring from the clothing business, effective immediately and sold the contents of the store to the Schloss Brothers, competitor retailers in the State Life Building next door. The American 5 and 10 Cent Store leased the available space. It wasn’t long until Saks family members disposed of their Indianapolis real estate holding in 1913; L. C. Boyd and Arthur V. Brown purchased the piece of real estate as an investment. They, in turn, sold it to William H. Block at the end of 1915 for $800,000 plus a few properties on Illinois street. Andrew Saks’ son Horace sold his majority interest in Saks and Co. to Gimbel Brothers in 1923. In 1924, Horace Saks and his cousin, Bernard Gimbel, opened the familiar namesake “Saks Fifth Avenue,” carrying on the family tradition of creating and dissolving partnership combinations. It’s unknown if descendants of the original owners still hold any stock in the company as it is presently organized, but the Saks name lives on in Indianapolis and around the world. 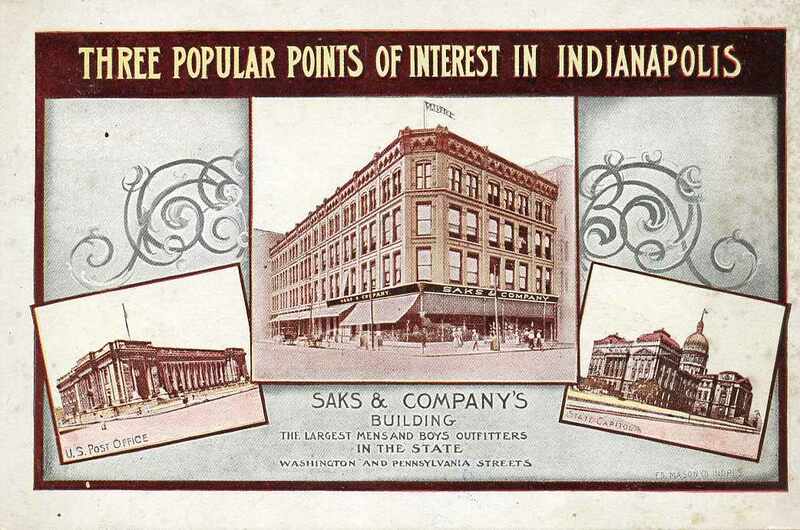 As for the original Saks building of Indianapolis: in 1923, William H. Block leased the ground to another 5 and 10 cent company for 99 years. They tore down the Saks building and erected a different four-story building. 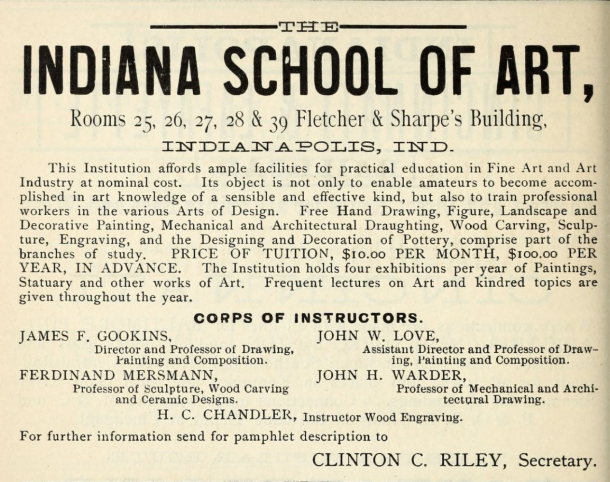 Another piece of Indianapolis history worth mentioning as relates to the Fletcher and Sharpe building: the first official art school of Indianapolis, known as the “Gookins and Love” school opened in Fletcher and Sharpe’s building on October 15, 1877. They started with 11 well lit rooms on the upper floors and taught classes in painting, modeling, engraving and architectural drawing. In 1883, advertisements touting the reopening of the art school appeared, under the tutelage of Mrs. A. E. Ferry, which went on for a number of years. 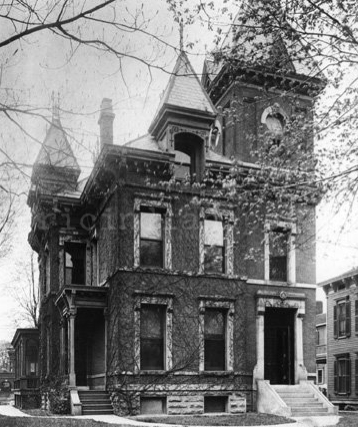 Indianapolis architect, J. H. Stem also had offices in the building in the 1880s.